I had heard about this infamous club years before I even dreamed of coming here, I didn’t even know it was located in London until I arrived here. I decided to go out the other night, despite feeling like total garbage and get my dance on at this epic drug den. My Fabric London review starts with this: 20 pounds as an entry fee to get in. OUCH. Most clubs around here aren’t that expensive, but whatever, I wanted to see what this place was all about. Totally mean-mugging door people were a little off-putting for a nightclub, but that’s just me. If you like electronic dance music, dubstep, and drum and bass, this is probably the perfect playground for you. There are a bunch of different rooms through tunnels, which are super dark, and a little spooky. Good thing I checked my stuff before I really got in here. It’s probably a good idea to create a meeting point with your friends when you’re here, just in case you get lost in a swarm of people. Drinks here are pricey, so I recommend pre-gaming at home and at cheaper bars before you decide to head here. Also, be careful with your stuff, people are so stealthy when they’re stealing your stuff. One minute your dancing with an attractive stranger, the next moment your purse is gone. Check your bag, wear one of those hidden pocket things or keep your eyes on your stuff. Make sure to not put your clutch between your arm or other thief-prone areas, they’ll swoop ’em up without you even realizing it. Anyway, the crowd at fabric is pretty grim–a lot of douchey looking guys trying to hit on girls (no surprise there) but there are so many guys, which isn’t as great as it sounds, trust me. Everyone was REALLY drunk, the place reeked of bad decisions. 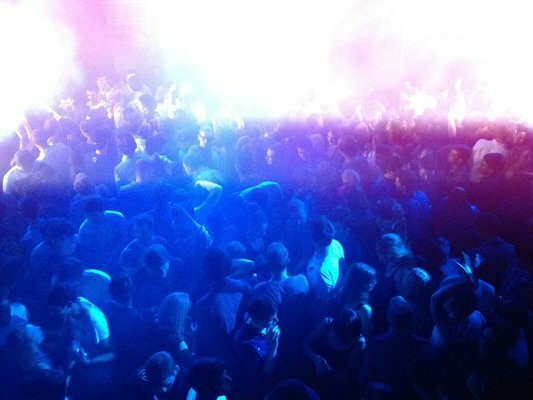 Fabric also hosts a myriad of drugs within its parameters, so much molly, ecstacy, and other party drugs were being done–it was really obvious who was high. The DJs who come here are pretty varied, some serious EDM up-and-comers are on the itinerary, so if you’re into the club and dance scene in London you NEED to check out Fabric.